KIISing Lips at Giant Inflatables! When you do a job well, invariably word-of-mouth leads to more jobs. When you do it excellently, you can get 3 new jobs like we did on this KIIS job for Australian Radio Network (“ARN”). When ARN was looking for some custom illuminated inflatable logo KIIS lips with programmable internal illumination, they had no hesitation in contacting Giant Inflatables to do the job. The best referral is a job well done and that is what we deliver time and time again. After we produced 2 highly visible inflatable shelters, we were asked to make an inflatable logo that had internal programmable lighting. It was a fun, but challenging ask. How to put programmable illumination inside an inflatable, controlled from the outside without disturbing the inflation or deflation. 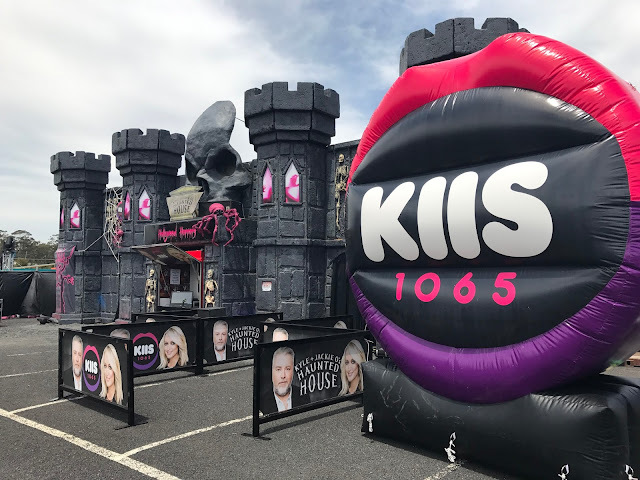 Well once again our Genius Design Team put it together with our engineering wizards to create the custom illuminated inflatable logo KIIS lips. Another lesson in Experience - Cheap is Dear !When we were approached by one of our dynamic clients, Bubble Soccer 2 Uto redesign their Dart Soccer Target Board which they bought directly from a Chinese Manufacturer online we started thinking about why our clients use Giant Inflatables to supply their inflatable, interactive, sports activations when they can order from China off the web for a 1/3 of the price. It really all boils down to Intellectual Property and Design. 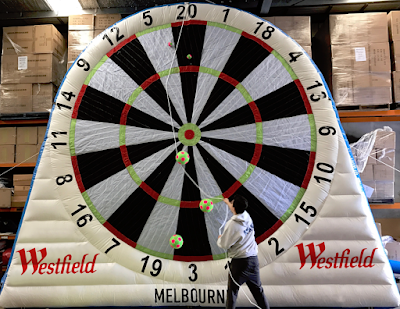 Our Genius Design Team incorporate cutting edge technology and experienced based design to create unique inflatable product that are lightweight, reliable over its event life, and simple and safe to operate. The saying that “Cheap is Dear” really is applicable here. The cheap off the shelf Chinese version that our client purchased turned out to be so heavy and cumbersome that the one amazing benefit of Inflatables is completely removed, namely, portability and ease of set up and pack down. 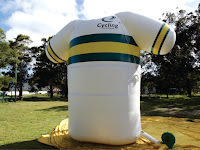 When we created our first Giant Inflatable Branded Jersey for the Corporate Sponsor of a sports team we created the shape and design which would accommodate our inflatable technology. Our first attempt was the Cycling Australia Jersey with a replaceable Velcro patch with the name of the event as a removable banner. It worked perfectly adequately in that it was a Giant Inflatable and therefore highly visible with clear branding and notification of the event name. But it was not as precise as other replicas we had created in a smaller version. Our next request to create a Giant Inflatable Jersey was by the Sponsoring Insurance Company NIB who set up an entire playground with fantastic branding. Standing out from the crowd was the enormous, highly visible and highly branded NSW Blues Jersey. The Australian Open is the first of the four annual global tennis events known as the GRAND SLAM. The other three in the competition are the US Open, Wimbledon and the French Open. The Australian Open has the second highest attendance figures (second to the US Open). KFC BBL season is starting……Summer is on the way……. 20 December is Big Bash! No matter which team you support, there is lots of fun to be had. First off, how many BBL Clubs 2nd name start with the letter “S”? How many BBL Clubs 2nd name starts with the letter “H”? What are the remaining 2 BBL Clubs 2nd names? Answer these questions in the comment section below and you stand a chance to win 4 free tickets to a BBL Game! Who knows, we may even throw in a KFC Family Bucket? 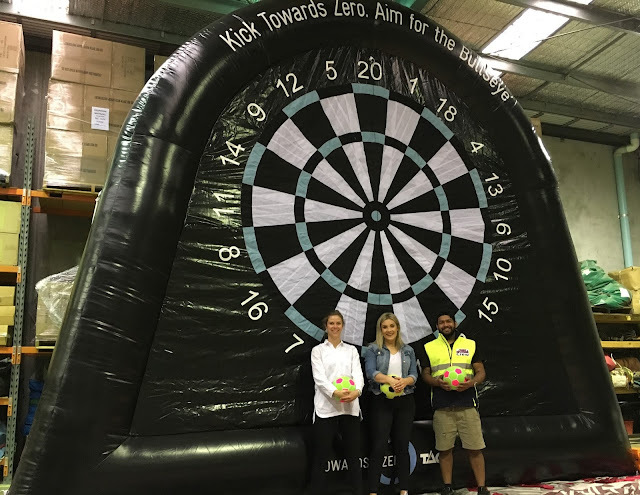 Cricket Australia and your favourite KFC /BBL Teams continue to make use of engaging inflatable cricket games for Training, Fan engagement and Brand Activation. There is no second chance to make a first good impression. When you have to make an impression at an event or exhibition and you want to create a highly impact-ful, engaging environment, try Inflatable Shelters and Structures to create that Wow! Factor. The Perfect way to create the environment is with Giant Inflatables Shelters, Structures, Offices and Shapes. These eye-catching, larger-than-life attention grabbing structures set the scene and draw your customers in with its mysterious shapes and lights. The beauty with Inflatable Structures is they can be any size and shape you want, are safe and easy to install, pack away and transport and are hugely impact-ful on the crowds. Let us assist you to create the perfect setting. Need a bit of arm twisting, read on to see why Giant Inflatables Shelters and Structures are the perfect way to create an awesome event. NRL 2016 Finals – who's in the running? It is that time of year again – Finals. Who is going to win? Here are some thoughts and why we choose Melbourne Storm. The Penrith Panthers have an incredibly intuitive and talented pool of young players. If they can stay in the game, keep up their unstoppable attack and keep building their defense, they have a solid chance at being a side to watch. Sitting at number 5 on the Finals Ladder, the Brisbane Broncos are an experienced and talented team with depth of experience in Origin and Test players. Provided all players are firing on all cylinders, this outside chance could be a threat. Come on Ben Hunt – show us what you can do! Welcome to the wonderful world of POSreplicas. POS inflatables are inflatable products most often displayed at the point of sale of a product. These attention grabbing, larger-than-life, replicas are the perfect way to activate a brand. One of the key ways to activate a brand is to attract consumer interest and attention at the Point of Sale to stimulate the purchase of the product. Add an activity to get consumer engagement and you kill two birds with one stone. Firstly your consumer notices your product and secondly by actively creating a POS with a taste test or throwing competition to win a product by throwing at the POS inflatable target you add the dimension of engagement - one of the most powerful tools to communicate a brand with a potential consumer.